Year of issue 2016 г. The obverse of the coin features an image of the Poibrene Cross with ‘БЪЛГАРСКА НАРОДНА БАНКА’ (Bulgarian National Bank) inscribed in circumference; at the bottom the inscription ‘10 ЛЕВА’ (10 levs) is separated by the BNB logo with the year ‘1879’ on the strip; the year of issue ‘2016’ is underneath. The reverse features an image of Benkovski’s Flying Squadron and a contour inscription of the year ‘1876’ in the background with ‘140 Years since the April Uprising’ inscribed in circumference. The obverse of the coin features the BNB logo and the year ‘1879’ on the strip; inscriptions ‘БЪЛГАРСКА НАРОДНА БАНКА’ (Bulgarian National Bank), the nominal value ‘100 ЛЕВА’ (100 levs), and the year of issue ‘2015’ in circumference. The reverse features a canonical image of St. Mina on horseback in the desert near the city Cotyaeum; an inscription ‘СВЕТИ МИНА’ (St. Mina) in circumference. The reverse features Bulgarian Secret Central Revolutionary Committee members; the lion of the Golyamo Konare detachment’s banner and the motto ‘СЪЕДИНЕНИЕТО ПРАВИ СИЛАТА’ (Unity Yields Strength) underneath in a gold-plated circle and the inscription ‘130 ГОДИНИ ОТ СЪЕДИНЕНИЕТО НА БЪЛГАРИЯ’ (130 Years since Unification of Bulgaria) in circumference. 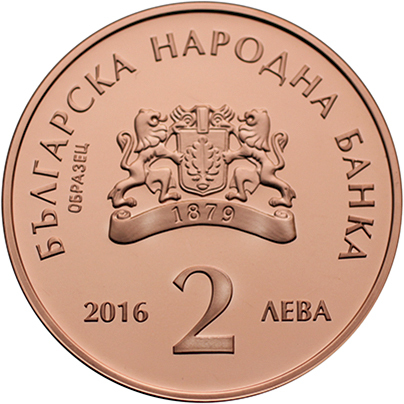 The obverse of the coin features the BNB logo with the year ‘1879’ on the strip; ‘БЪЛГАРСКА НАРОДНА БАНКА’ (Bulgarian National Bank), the nominal value ‘10 ЛЕВА’ (10 levs), and the year of issue ‘2015’ inscribed in circumference. The reverse features an image of the first Bulgarian powered aeroplane – biplane, designed by Assen Jordanoff; the inscription ‘БЪЛГАРСКО САМОЛЕТОСТРОЕНЕ’ (Bulgarian Aircraft Manufacture) and ‘100 ГОДИНИ’ (100 Years) in circumference.